This review of Fullmetal Alchemist: Brotherhood covers episodes 34-64, and obviously shouldn’t be read without having read the prior review of Part 1, or episodes 1-33. More importantly though, if you haven’t seen this series before and you’ve come straight here having read my Part 1 review, please don’t continue to read this second part, as it features a few key spoilers from Part 1. These spoilers were unavoidable as a part of reviewing scenes that so heavily depended on knowledge of previous events, but I do take care to avoid any major spoilers for this second part itself, so feel free to read without fear. If you’ve come here after reading my first review, you’ll know that this series is one of my personal favorites and a golden standard by which many other anime should hold themselves to. And Part 2 of this incredible anime is no different than its first half, even surpassing it in almost every respect. 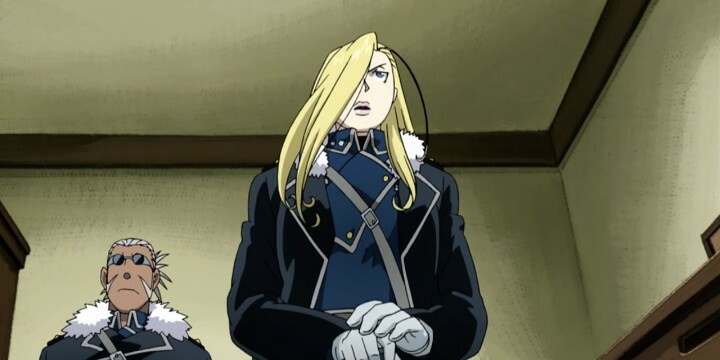 The first Act of Part 2 leaves us right where we left off, with Edward and Alphonse Elric meeting General Olivier Armstrong, the imposing and brutally pragmatic sister of Major Alex Armstrong, and her forces at the Briggs Mountain Fortress. We quickly come to learn a little bit about this particular group of soldiers and the freezing environment they protect from the northern antagonistic nation of Drachma. However, as with any moment of quiet in this show, it doesn’t last long and Briggs comes under attack by the hapless homunculus Sloth, a truly monstrous slowpoke that (not so) quickly runs amok in the fort until he’s contained. It’s at this point that we’re really introduced to how ingenious General Armstrong really is, as she easily picks apart the Elric brothers’ lame excuses in order to figure out the truth. And when she is finally given the answers she needs, whilst helping the brothers discover Father’s plot to use the entire country of Amestris as a giant transmutation circle, she enacts quite possibly on one of the most brilliant schemes of the entire series. In fell swoop, she not only removes one of Father’s lackeys from the picture, but she also manages to secure a place for herself in Father’s inner circle as a double agent. But soon after General Armstrong makes herself one of the brothers’ closest allies and earn the good guys a much-needed victory, the plot begins to feel a bit stalled as our protagonists continue the hunt for Scar at Kimblee’s behest. This side-plot, while successful in recruiting Scar and some key allies for the battle to come, feels out of place in regards to the series as a whole. Because we know the end is in sight, it makes watching this long, build-up act feels superfluous, as if the story just needed some additional padding to get to the point we all know is inevitable. Meanwhile, a quick revelation regarding the identity of Bradley’s son as the first homunculus, Pride, comes out of left field, which for this series is a very serious accomplishment. Prior revelations, like Bradley or even Father’s plans, were so heavily hinted at throughout the series that they hardly came as a surprise. But I was actually taken aback when the show started hinting at Selim’s true identity, only to reveal it not even five minutes later. It’s another testament to this show’s superior writing that it could keep me on my toes so late in the game. And another testament to the series’ strengths is that, even during what I consider to be its slowest arc, it still manages to deliver some of the most emotionally poignant scenes in the entire series. 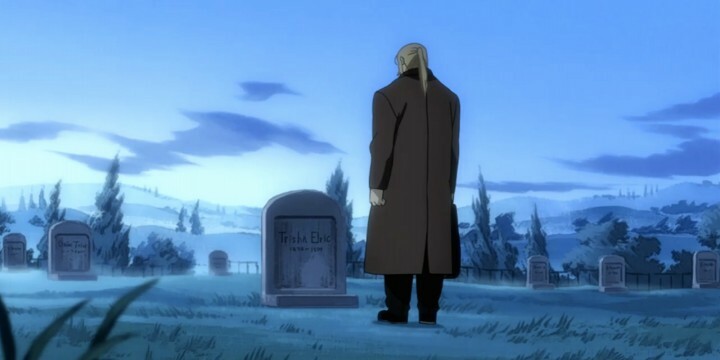 Throughout this arc, but particularly in one incredible episode, we’re treated to flashbacks about Hohenheim’s life with his children and his wife, before he was forced to leave. 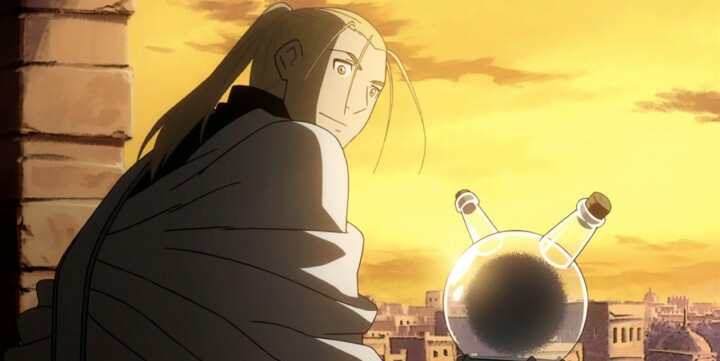 However, the real treat is the aforementioned episode wherein we’re shown Hohenheim’s early life as a slave in the ancient country of Xerxes, where he encounters and befriends the “dwarf in the flask” that would eventually become Father. This episode alone provides more character development than some series manage to accomplish in their whole run and stands as one of my personal favorite episodes. This section, as compared to the previous episodes’ rather dire circumstances and situations, gives our heroes a few more wins than we’re used to seeing, even as they split up in various directions. 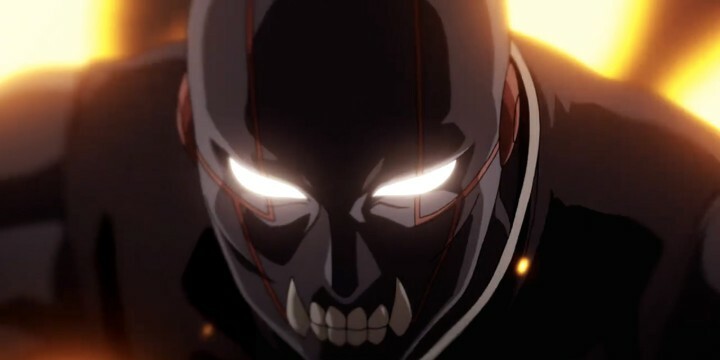 Alphonse’s group, with Scar and Marcoh, separate soon after capturing Envy, after it becomes necessary to amass more strength for the counterattack to come. Al’s return to Liore, meanwhile, is a nice change of pace, as having Hohenheim reunite with one of his sons is a great emotional moment. We finally get to see Hohenheim, an absolutely tortured soul, have at least one small victory as he reconnects with Al. Meanwhile, the ever-shifting balance between allies and enemies shift yet again when Greed, still in control of Ling’s body, comes into conflict with Father when he realizes that that he too desires whatever Father desires. His turn to the good side — or at least morally-ambiguous side — is an exciting change for the series because Greed, with Ling gaining more and more control, is quite unpredictable and that makes him a joy to watch. As Edward joins his little rebel group, it struck me as odd that such a relatively minor character managed to steal whatever scene he’s in; it’s really a testament to how well written his character is. The only critique I can offer here is the similarity between this arc and the last, in terms of feeling like an interim period you just have to “get through” to see the final act. However, this time around, this act’s short length keeps it from overstaying its welcome, and feels like the pieces are finally in place for the “day of reckoning” to come. It’s from this point on that the show’s pace slows down incredibly and yet, at the same time, somehow manages to feel as lightning-fast as ever. To understand what I mean by that contradiction, it’s important to understand that everything in these last 18 episodes happens over the course of two days. When you compare that to how the series so easily would jump months at a time earlier on, this is a dreadfully slow pace, very much akin to the popular critique of Dragon Ball Z taking 20 episodes for one fight. However, to Fullmetal Alchemist: Brotherhood’s credit, the 18 episodes don’t even feel like 18 distinct episodes; they all sort of bleed together into one very fine product. Even coming up with dividing points for this review was difficult at times because I had literally forgotten how many episodes had passed by the time I saw a good transition point; the show is that captivating. Conflicts featuring Alphonse have always felt especially flat to me. 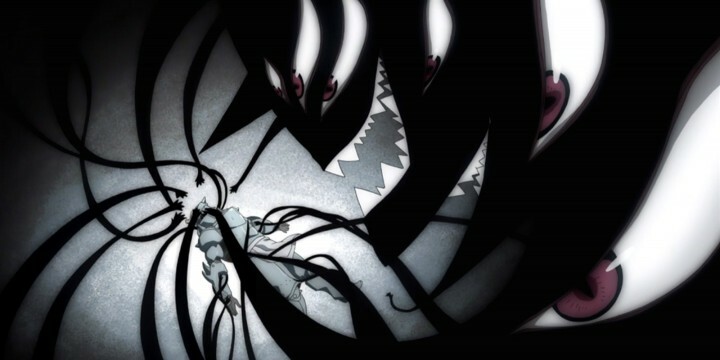 The main conflict of this very short act is the capture and exploitation of Alphonse by Pride and Gluttony. By controlling Alphonse’s actions, Pride hopes to capture the other necessary “sacrifices” for Father’s plans, namely Hohenheim and Edward. 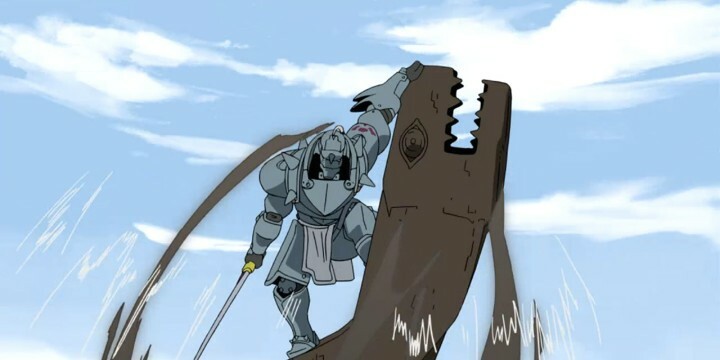 However, for whatever reason, I never really felt like Alphonse was in danger or that any harm was going to befall our heroes at any point during this multi-episode struggle. 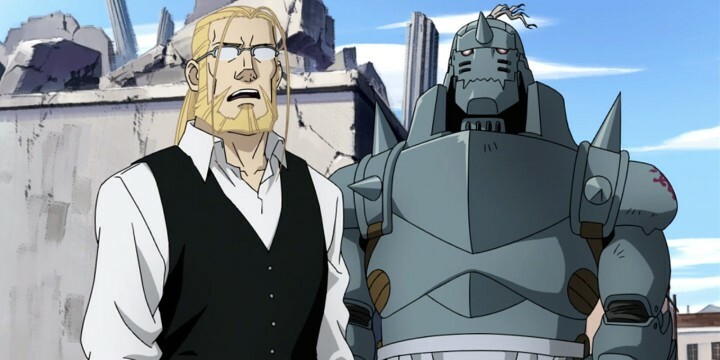 While that lack of tension is partly thanks to the fact that we know how powerful Hohenheim really is, it’s really just the fact that conflicts featuring Alphonse have always felt especially flat to me. Stepping back all the way to the time when Alphonse was tricked by Barry the Chopper into believing some lame story, or the time Alphonse was captured by the original Greed, I realized that I’ve never felt particularly attached to Alphonse beyond sympathizing with his situation; he always felt ancillary to his brother, who easily dominates whatever scene he’s in. And only now, after my umpteenth time seeing this series, do I understand why. Alphonse, in terms of the audience’s potential emotional attachment to him, is fighting with a handicap; he literally has no physical human qualities with which to attach yourself to. A big part of human empathy is that there needs to be some sort of shared connection between the two people trying to relate to one another, and this extends even to fictional characters. We relate to Edward, for instance, because we all know the pain of loss and we can see it on his face, literally, when we see him suffering. With Alphonse, however, all we have to go on is his tone of voice and the knowledge that, at one time, he was a human boy. How can you fully empathize with a suit of armor occupied by a human soul? You really can’t. So, while we can relate to what Alphonse used to be, it’s hard to do so with his current body, and that’s been a challenge since the very first episode of the series and it’s not easily overcome. This arc then, fails to capture the audience’s attention when, yet again, Alphonse is the one in danger and not our more human protagonists. You may disagree with my assessment — and that’s fine — but one cannot argue that this arc became less about Alphonse and more about reintroducing characters from Xing or repairing the bond between Hohenheim and Edward. After the last, slightly disappointing arc, from here on out the show begins firing on all cylinders again as we’re shown the launch of Mustang’s rebellion in the heart of Central City. It’s great seeing everything come together as it does in these episodes, as even old faces I had long since forgotten returned to the fold and contribute in fairly major ways. And while the addition of Father’s legion of undying soldiers seems like a pittance compared to the real threats we already know exist, they do serve as useful fodder for the unique skills our vast cast of heroes possess, as even Olivia and Alex Armstrong team up to defeat this new threat. Speaking of which, the Armstrong siblings’ battle with Sloth is one of the more interesting fights in the series, if only because it’s constrained to one hallway. This makes it one of the smallest fights in the series, in terms of scale, and yet one of the largest if you consider the sheer size of the combatants. It’s interesting that even such a minor antagonist such as Sloth proves to be such a considerable obstacle, even if the end of this battle feels a little bit anti-climatic. As an instigator for philosophical inquiry, Kimblee is unmatched. 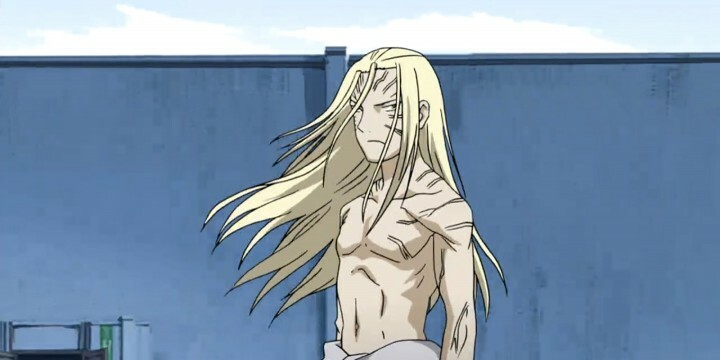 Meanwhile, Kimblee’s return to the conflict is again just as unpredictable as the character has been since his introduction, as he frees Pride and does battle with the younger Elric brother. 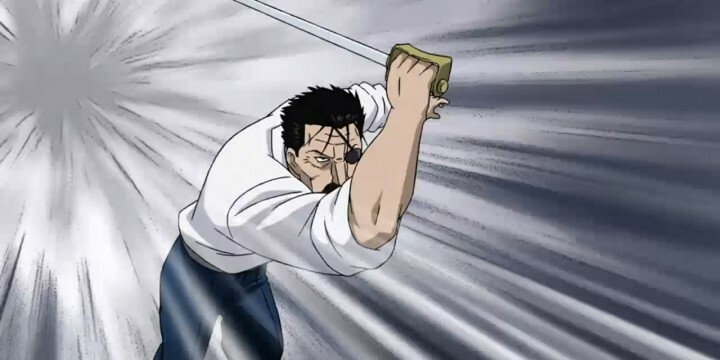 However, as my original critique of the character stated back in Part 1, it’s very difficult to take Kimblee seriously when we already saw him beaten not even an episode after his formal introduction. 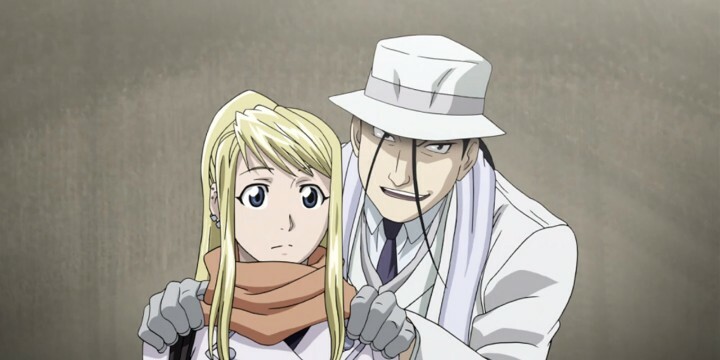 While his quick defeat at Alphonse’s hands isn’t necessarily surprising, I have grown to appreciate Kimblee for always pushing our protagonists to think deeply about what it is they’re fighting for; as an instigator for philosophical inquiry, Kimblee is unmatched. And I further appreciated this fight for giving us what is quite possibly one of the most visually stunning sequences in the anime. But the conflict that really propels this act forward and does bring closure to some of our earlier pains, is the battle between Mustang and Envy; or rather, the battle between Mustang and his furious need for revenge. Since Maes Hughes’ death back in Part 1, we as the audience have known this particular showdown was inevitable. But to see it happen is another story entirely. I was, for the first time, terrified of a protagonist in this series as Mustang methodically and cruelly picked apart Envy, burning him from head to toe repeatedly. 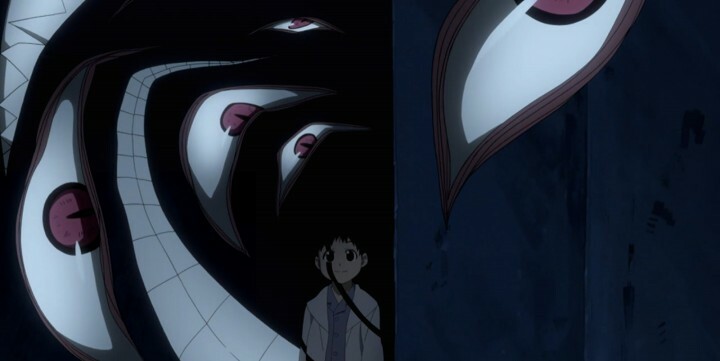 It was then that my own desire to watch Envy die for what he did subsided, and I just wanted Mustang to stop already. The emotional catharsis achieved when Mustang clashes with his closest friends felt like what one might experience at an intervention, and it’s easily another peak of this exquisite series as we’re finally given closure to Hughes’ tragic end, some 40 episodes later. A rather presumptuous celebration by Mustang’s men and the forces from Briggs is soon cut short with a brief, but terrifying, “greetings, I’m back,” from King Bradley as he joins the battle and easily cements his place as one of my favorite villains of all time. This man is truly a sight to see and whenever he’s in action, it’s as if the animation quality triples to accommodate his sheer dominance. 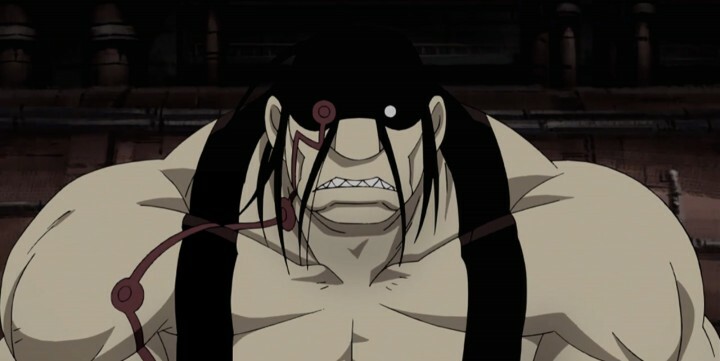 As we watch him engage a tank, Greed, Ling’s bodyguards, and nearly everyone in between as a one-man wrecking ball, it’s easy to forget that the anime’s arguably strongest antagonist lacks the regenerative powers of the other homunculi, or the god-like alchemy of Father; that’s what makes him truly excellent. Speaking of homunculi, Greed is no slouch in this act either. 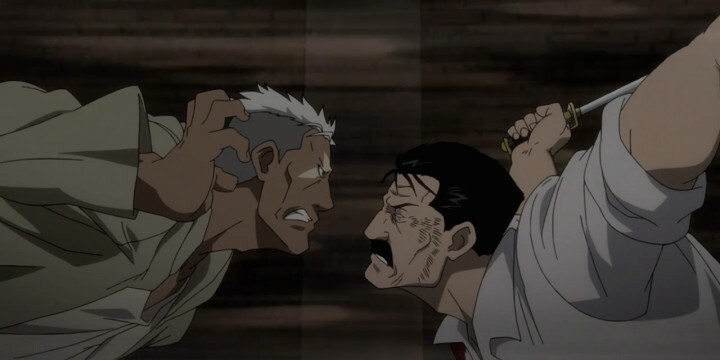 While he may not be as impressive from a combat perspective as his brother Wrath, Greed’s character arc in these few episodes is a touching one, having seen the character come nearly full circle from his original embodiment of selfishness. Now, don’t get me wrong, Greed is still plenty selfish by the end of this battle with Bradley. But when we witness him fight at the end, it’s important to keep in mind that this is the first time the character had ever fought for anything that didn’t benefit him in the slightest, and that fact marks an important bit of foreshadowing for events to come. 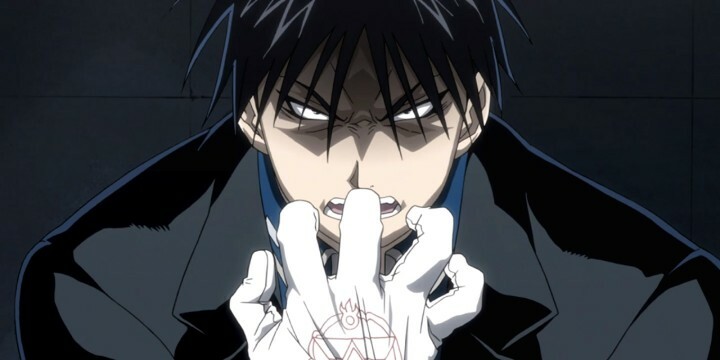 It’s interesting that a show can make two of its antagonists two of my favorite characters in the series, but that’s just what Fullmetal Alchemist: Brotherhood did for me. 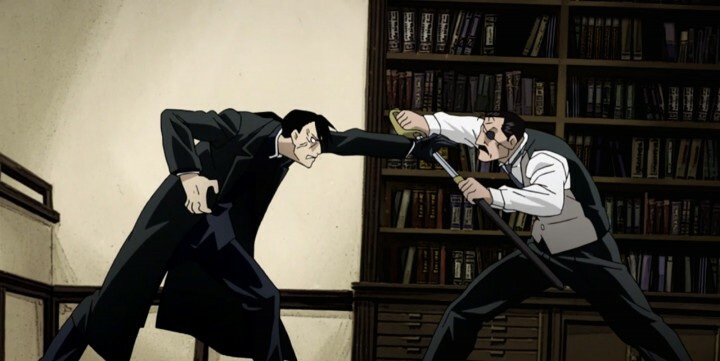 Meanwhile, Father and Hohenheim’s much-anticipated faceoff is about one of the most anti-climatic fights thus far, primarily because we don’t even get to see the ending. Even so, Father is successful at gathering his necessary sacrifices all in one place and accomplishing his ultimate plan with the timely help of Pride and Wrath, both wounded from their many battles. One final act of cruelty that I don’t wish to spoil, lest I ruin its emotional impact, reminded me that the bad guys are very much the ones in control here and that’s in spite of the many sacrifices made to achieve the few victories our heroes had accomplished up until now. To make matters worse, watching Father succeed in “swallowing God” made me sick to my stomach because, no matter how cool the bad guys are, it’s tough watching them win. Writing the end of a review like this is always difficult. Even the smallest bit of extra detail at this point in the game is a potential spoiler, to the point that even saying a character’s name in the wrong verb tense can ruin the end of a series for someone who hasn’t watched it yet. So, in the interest of leaving the show as unspoiled as possible for new readers, I’ll keep this last section vague and restrict myself to covering what I view as the three climatic battles of the series, and the thematic significance therein; no results here, promise. First on the list is the final encounter between Edward and Pride, a battle between two nearly perfect foils for one another. For me, Pride had always represented a bit of what Edward was, or at least what he had the potential to become had he never learned from the consequences of his failed human transmutation. Pride, as a character and the sin, is the embodiment of narcissism and the extreme of believing in one’s self. Believing in one’s self is not a sin on its own, but not by humbling yourself and only taking pride in your abilities, you become a monster. 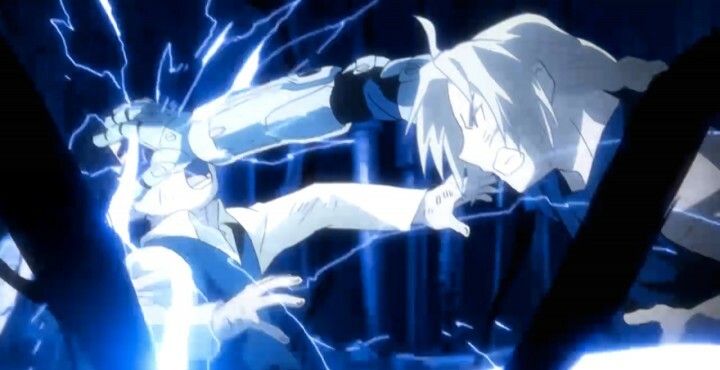 So, when I watch this particular fight, I see it primarily as Edward rejecting the side of himself that does take pride in the fact that he’s a talented alchemist, while being humble enough to accept his limitations, something Pride cannot do. My personal favorite fight is between Scar and Bradley. The second climatic fight, and my personal favorite, is between Scar and Bradley. For a while, I had wondered if these two were ever going to cross paths, given their shared history. Speaking of which, it’s ironic that in spite of that shared history, neither character had come across the other in the entire series to this point. Bradley, in a way, created the beast that Scar was in the early parts of the series when he was hell-bent on revenge, and it’s absolutely fitting that the two should face one another. Even Bradley couldn’t help but point out how utterly poetic it is that two nameless men should face one another. However, the biggest difference between the two is that, nameless though he is, Scar is still capable of bettering himself in ways that Bradley couldn’t even imagine. Bradley is literally a manufactured human being with only a single decision he made on his own; he can never overcome his nameless past in the way Scar can. Finally, that leaves us with our final battle, or as I like to call it, Father versus the World. I mean, I don’t think there’s a single major character that doesn’t get some sort of shot in on Father during this spectacle of a finish. And that’s fitting, given his rejection of humanity and the world as it exists, that he too should be rejected by that same world. Although the battle has its twists and turns and a few unexpected losses, it’s still one of the most satisfying experiences to see Father fall as he does. 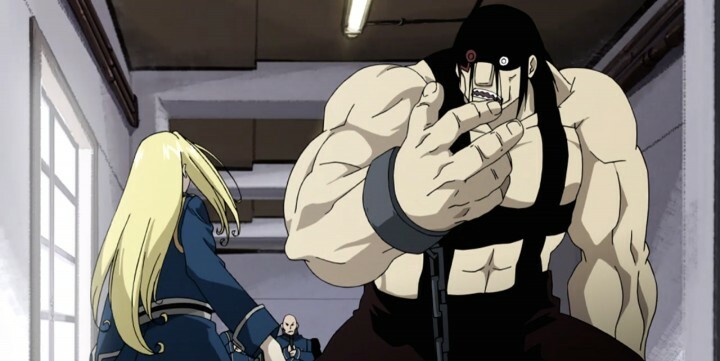 And even so, Fullmetal Alchemist: Brotherhood manages to pull one final coup on my “feels,” as somehow in his final moments, we’re brought to feel sympathy for Father, or the Dwarf in the Flask. This tiny creature fought his way to the pinnacle of existence simply because he didn’t want to be defined by his limitations, and that’s an admirable goal. But ambition for the sake of ambition is a pointless jest. And in a sharp contrast, the final decisions of Edward and Alphonse embody the difference between the two brothers and the Dwarf. To be honest, when I first saw the end of the series, I felt a little disappointed by what I thought was a hollow moral to the story. But, having matured a bit since then and having watched this series more times than I care to count, I now understand that this is the only ending that would do. This is a series on loss and having, and the strange divide between the two phenomena. Just as Maes Hughes’ death was balanced with the birth of a baby, and just as the dark moments of the series were balanced by quirky humor, this series tries to tell us that, no matter the loss we experience, we can still come back from it. In fact, that loss is what gives life meaning in many ways; without loss, one can never appreciate having something dear to hold onto. And given what the Elric Brothers had sacrificed in this series, it’s good to see them still have something to hold onto in the end. Fullmetal Alchemist: Brotherhood is one of the finest anime ever made; it’s just that simple. Even at its weakest moments, it still shines as a standard for other series to follow. Sure, I had my gripes here and there with the sometimes awkward pacing, or the regrettable relegation of Alphonse to a purely support role towards the end of the series, but those complaints pale in comparison to the many, many good things I can say about this series. I can sing this show’s praises all day and tell you why its sharp contrasts between loss and having, life and death, and solemnity and humor, make it as perfect as it is — but then I’d be stopping you from finishing this review and watching it. Go watch Fullmetal Alchemist: Brotherhood; whether if it’s your first time or your tenth, it never gets old.